Irrevocable Asset Protection Trusts in Florida for Medicaid | DeLoach, Hofstra & Cavonis, P.A. As we age, we have a greater likelihood of needing to spend time in long-term care. For those over age 65, there is a 75% chance that you will not be able to live alone for the rest of your life. When you have to move from your home, the costs for the nursing home can exceed $10,000 per month. 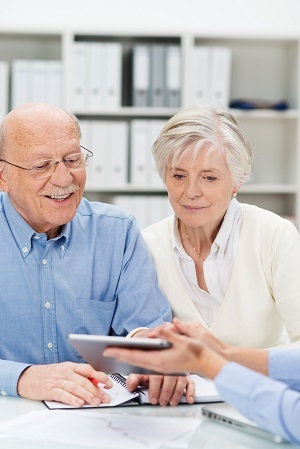 While asset protection planning for Florida Medicaid is possible, even during the five year look-back period, it may be best to look at setting up an irrevocable asset protection trust five years before you need long-term care. Established by yourself or your attorney-in-fact five years before you apply for Florida Medicaid benefits. You have no access to the trust principal during your lifetime. You may maintain an income interest in the trust if you want. You name a trustee to manage the trust assets during your lifetime. Generally, your children are the lifetime beneficiaries but the assets do not go to the children until your death. Assets in the trust protected after the five year Medicaid transfer penalty expires. Asset in the trust receive a step-up in basis upon your death, meaning your heirs can sell the trust assets tax free upon your death. You can give assets to this trust three years before you need VA Pension benefits. Why would you want an Irrevocable Asset Protection Trust? Dad, age 80, is healthy. He has a home and about $500,000 in the bank and in brokerage accounts. He has 3 children he trusts and that he wants to leave a legacy for. After consultation with our office, he believes his health will last at least for the next five years. With this, he establishes an irrevocable trust and transfers some $400,000 of his assets, including his home, to his trust. His most trusted child is trustee of this trust, which distributes all trust income to Dad during his lifetime, but no trust principal. After five years, the trust assets are protected in the event dad goes into the nursing home and needs to apply for Medicaid. Upon Dad's death, the trust assets, now valued at $500,000 (from $400,000) due to growth, are distributed equally to his children, who also receive the assets with a "step-up" in basis, meaning the trustee can sell the assets income tax-free. Here, Dad retained enough money to keep for his own enjoyment and he had his own pension and social security to live on. He created this trust to leave a legacy to his children, and he had a trusted family member to serve as trustee. While not for everyone, irrevocable asset protection trusts can be a way to make sure your hard-earned assets do not disappear to the high cost of nursing home/long-term care. Trusted and responsible family member(s) to serve as trustee - very important! What about Protecting Your Homestead Property? An irrevocable asset protection trust may hold your Florida homestead property and protect it in the event you need to go onto Medicaid. Even if you do not have a great deal of assets other than your home (such as in the example above), then it may be helpful to place your homestead property into an irrevocable trust. I have written a guide to Protecting Your Florida Homestead Property if you want to learn more. Why not just give assets outright to the children? If you just give assets to the children, the assets do not receive a step-up in basis upon your death, potentially costing the family a great deal of money if your assets have gone up in value. Upon your death, your assets are not valued at their original basis, but will receive a new basis based upon the asset’s date of death value. This is generally referred to as a “step-up” in basis, which allows heirs to sell property without paying taxes on the gain during the decedent’s life. Thus, your heirs inherit the property with the date of your death value, thus providing a tax free gain in appreciated assets to your heirs. Example: Mother purchases Exxon stock in 1990 for $40,000. The stock has appreciated to its present value of $200,000. To protect the stock from the nursing home, she gives it away to her daughter five years before she gets sick. If the daughter sells the stock, she have to pay income taxes based upon $160,000 in gain. This gain would be taxed at a rate that could exceed 40%, based upon daughter’s income tax rate, costing the daughter some $60,000(+) in income taxes when she sells. Example 2: Same facts as above, but mother places the stock into an irrevocable trust. Daughter holds the stock in the irrevocable trust for mom's lifetime. When mom dies, the daughter inherits the stock tax-free, as the stock receives a step-up in basis upon mom's death. What other options exist if we want to protect our assets from the nursing home? Purchase long-term care insurance or life insurance/annuity policies with long-term care benefits inside them. These options are generally more helpful than giving all of your money away as the law may change in the future. Your basic estate planning. Make sure you have a good estate plan, such as creating a revocable living trust and a great durable power of attorney prepared by a Florida elder law attorney. These documents will allow your assets to be protected by a good elder law attorney, even in a crisis. Look to VA benefits, although we generally would look to VA benefits to pay for in-home care or assisted living because the nursing home is so expensive. We have more information on VA pension benefits and irrevocable trusts here. We recently created our free guide to Irrevocable Asset Protection Trusts. The information presented here is given with a more detailed explanation of Medicaid and VA benefits, among other matters. Most trusts created by attorneys are revocable living trusts. These trusts enable you to control your assets during your lifetime but also avoid probate upon your death. But standard revocable trusts do not protect your assets from the high cost of nursing home care. This blog post has more on revocable and irrevocable trusts for your consideration, which also includes special needs trusts in Florida as well. What if the elder is already in the nursing home? This article is mostly written for those looking to protect their assets at least five (5) years before they would apply for Florida long-term Medicaid. If your loved one is already in the nursing home or may be in one soon, we have more information on Medicaid and spend down planning. If your elder just went to the nursing home due to a downturn in health, you will want to read more on common questions to ask if your elder just went to the nursing home. If you or your loved one recently had an Alzheimer's or dementia diagnosis, you would want read about legal steps to take upon a dementia diagnosis. You may also want to download our free Guide to Alzheimer's Care from our website. Get a Free Copy of our Books! 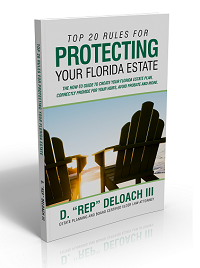 If you want to learn more about estate planning in Florida, including asset protection planning and irrevocable trusts, the Top 20 Ways to Protect Your Florida Estate will be very helpful. If you want to learn more about long-term care, asset protection, Medicaid and VA benefits, we have another book: Protect Your Nest Egg from the Nursing Home. This book deals less with estate planning issues and more with caring for a loved one already in the nursing home and for ways to protect your assets both before you are sick and even if you are in the nursing home.